myoldmac.net - Vintage & Classic Apple II Collectibles - Buy it now! ...one day late in 1982, Paul Dali showed Steve Jobs a photograph of a Toshiba portable and they started fooling around with the idea of an Apple II that would look like the Toshiba but come with a built-in disk drive. They took out a IIe circuit board and a disk drive and a keyboard and played with them until they arrived at a promising configuration - keyboard in front, disk drive in back, circuit board in between. What got Jobs excited about this idea was the engineering difficulty of squeezing it all into a package not much bigger than a notebook. In April 1984, Apple unveils the Apple IIc with an intense publicity extravaganza, at the Moscone Center in San Francisco (read the Article: Apple announces Apple IIc at the F.A.Q. Section). During the presentation at Apple Forever, CEO John Sculley made sure everybody had an Apple IIc to look at. When he asked the large crowd of Apple enthusiasts if they wanted to see a IIc at work, a large crowd yelled back in consent and 1,000 IIc's were held up for display. Priced at US$ 1300, 2,000 dealers place orders for more than 52,000 units on the day of its introduction. The Apple IIc was the compact (the "c" means compact) version of the Apple IIe. 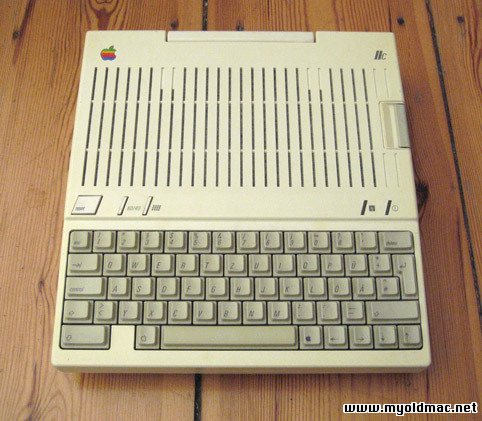 It had the same characteristics but lot of features which were optional on the IIe were provided on the IIc (floppy disk drive, 80 columns display, color display, 128 KB RAM), but unlike the Apple 2e, it had no expansion slots, so it was hard to add features to this computer. It came in a small white case, and was built around an enhanced 65C02 processor, running at 1.4 MHz. It had 12 kB RAM, (expandable to 1 MB) a built-in 5.25" floppy drive on the side, and could be used with a mouse. The Apple IIc+ was introduced in 1988, with a 4 MHz 65C02, RAM expandable to over 1 MB, a larger ROM, and an optional internal 800 kB 3.5" drive. 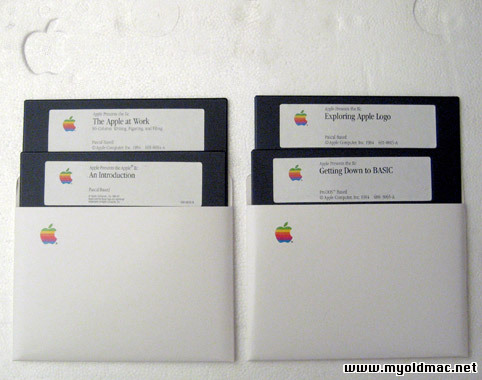 The Apple IIc+ was discontinued in November of 1990. It ran either with DOS 3.3 either with ProDos and had the first version of QuickDraw in ROM. The Apple IIc was originally designed to be a portable version of the Apple II, but it wasn't a stand alone system, it had a powersupply and no batteries, it coud also be used with a small 9" monochrome green screen which plugged into the unit. 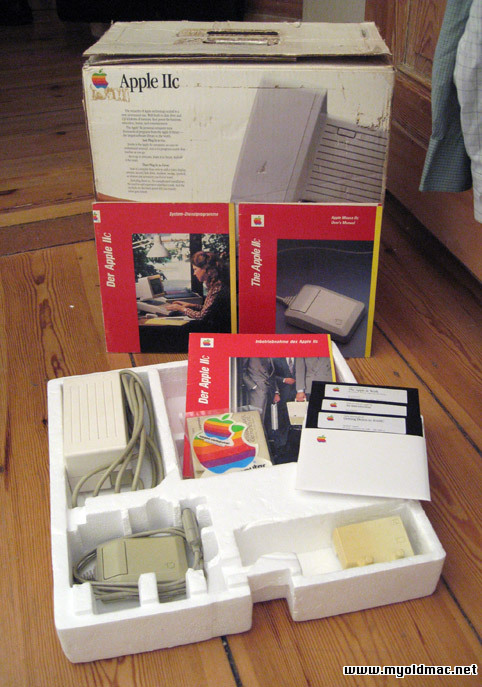 The Apple IIc was mainly used as a desktop computer. 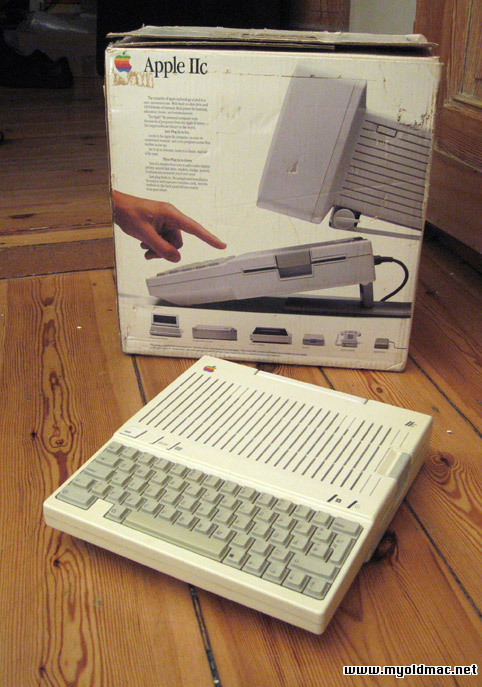 It sold well until it was discontinued in September 1988 with the introduction of the IIc+, the last computer in the II series. The IIc+ included the new 800k 3.5" floppy drive, 65C02 running at an option of 1 or 4 MHz using a built-in processor switch, memory expansion capability, and ports with mini DIN-8 connectors (same as IIGS and Mac Plus). Though much better than the IIc, it did not fare well due to compatibility problems and the rise in popularity of the Macintosh line and Apple II clones. 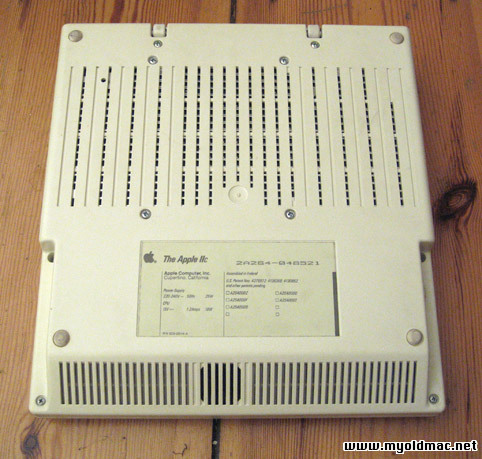 The IIc+ was discontinued in November of 1990.